The classic black Gas Dryer of Frigidaire is part of the companyís Affinity series. The modelís main features include TimeWise Technology and DrySense technology; the former allows you to schedule washing time right after drying time, while the latter lets you dry clothes and reduce the wrinkles produced during the process. Apart from these efficient features, the Gas Dryer also houses one of the largest capacities in its line. Frigidaireís gas dryer offers several cycle features. Depending on the size of your load and the clothesí fabric, you can set the cycle to normal, heavy, delicate, quick, normal, or even to the towels/bedding setting. Temperature options are just as flexible, ranging from high, medium, low, and maximum. For clothes that have been through rainstorms or extensive washing, temperatures can be set at more dry or damp dry. Thereís even an air fluff or no heat option for clothes that only need minimal drying. Dryness levels can be selected using five buttons, and the entire process can be secured by opting for the safety start. Thereís even a control lock option for added security, which is particularly useful for families with young children. An interior light allows you to see the drying process, while the Silent Design lets the machine run without disturbing its surroundings. 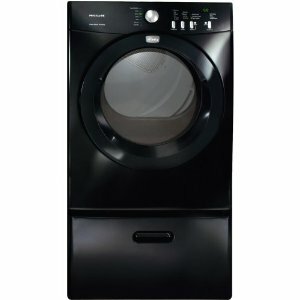 The Affinity gas dryer accurately senses when the clothes are dry through a moisture sensor. Once the sensor can tell when the process finishes, the dryer is automatically turned off, preventing fabric damage that could result from over drying. Apart from the classic black model, the Affinity gas dryer is also available in classic red and classic white. The painted steel drum finish produces a stylish design that suits any kind of taste. The door is reversible, letting users change the opening from any of its directions. This is an advantage for owners who will place the dryer in a small room. All controls used are electronic and user-friendly. Touchpads are used to sort through the different options and movable knobs specify the given settings. LED display lets users see the current cycle time by showing three kinds of status indicators. Menu option for the dryerís other functions can also be chosen through the screen display. Dryness levels, temperature selections, and auto dry cycles are all viewable. Express Select controls let users quickly adjust settings with a few touches of a button. TimeWise Technology makes the time you wait for clothes to dry equal the period used for washing. Quick Dry cycle only takes 25 minutes. Settings can be saved from your last cycle, letting you program the next run in just a few minutes. Unlike other dryers, the Affinity model doesnít include a sanitary cycle that kills germs and bacteria from non-machine washable items. Owners will have to wash pillows and stuff toys by hand. No steam cycle available to reduce the possibility of static cling. yers, the Affinity model doesnít include a sanitary cycle that kills germs and bacteria from non-machine washable items. Owners will have to wash pillows and stuff toys by hand.